Join THE 3-PERCENTER REPORT newsletter and receive the entire 12-volume "Underground Self Reliance and Self Defense Library" - FREE! What is a 3-Percent Patriot? It dates back to 1775 ... during the American Revolution, those who actively fought back against the King of England for their freedom never amount to more than 3% of the American colonists. You're reading this because you’re like them. You’re reading this because you want to find a way to prepare and to take a stand against the forces slowly eating away at our nation. You’re reading this because, like the Founders, you have the mettle, the grit, the spirit to live as free people in a genuine state of Liberty. Thank you for joining us at the 3-Percenter Report. We are honored to fight alongside you. You'll get immediate access to the entire 12-Volume "Underground Self Reliance and Self Defense Library" Set. 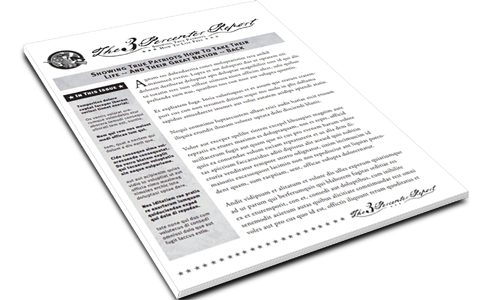 Then starting the 1st month, you'll receive our monthly newsletter called THE 3-PERCENTER REPORT. 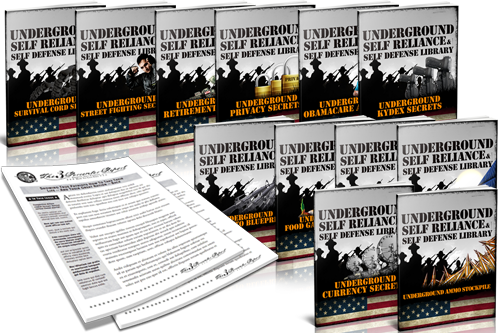 The entire 12-volume ""Underground Self Reliance and Self Defense Library" is chock-full of educational Reports & Manuals to teach you important self-reliance and self-defense skills. Join our newsletter for just $19.95/month and you'll get an ongoing self-reliance & self-defense education delivered straight to your doorstep each and every month. Need help accessing your membership? Lost your order details? No problem. Click here to contact us! We're here for you! Click here to contact us.